University of Illinois political scientist Chris Mooney has been named the new director of the Institute of Government and Public Affairs. Mooney will assume the post Aug. 16, according to the university. His appointment is subject to approval by the board of trustees, which next meets in September. The institute’s previous director, Robert Rich, retired last August and economist Fred Giertz has been the interim director. Rich directed the institute from 1986 to 1997 and then again from 2005 until August 2012. Mooney, the author of several books about state and local politics, has been a professor at the UI Springfield campus since 1999 and part of the institute since 2004. He holds the title of the Honorable W. Russell Arrington Professor of State Politics at IGPA and UIS. Mooney was featured by the Champaign News-Gazette on July 29, 2013. A longtime political scientist and faculty member at University of Illinois Springfield has been appointed as director of the Institute of Government and Public Affairs. Christopher Mooney, who joined UIS in 1999 and has been a member of IGPA since 2004, will succeed University of Illinois economist J. Fred Giertz. Giertz was named interim director in 2012 when UIS professor Robert Rich retired after serving as the institute’s director from 1986 to 1997 and 2005 to 2012. Mooney’s appointment is subject to approval by the U of I board of trustees. On Sunday, Mooney said he hopes to uphold IGPA’s mission to conduct exceptional public policy research, educate the public and provide assistance to government and policy-makers on critical issues facing the state. Prior to his appointment as director, Mooney authored or co-authored five books relating to Illinois politics. He wrote two of the books as a UIS faculty member: “State and Local Politics: Institutions and Reform” and “Lobbying Illinois”. He also was the founding editor of State Politics and Policy Quarterly, a peer-reviewed publication for research on state politics and policy. Mooney was featured by The State Journal-Register on July 28, 2013. University of Illinois trustees formally extended President Robert Easter's contract on Thursday and approved making him eligible for bonuses. When the UI Board of Trustees approved Easter as president in March 2012, following the resignation of Michael Hogan, the expectation was that Easter would serve in the role until June 30, 2014. The new agreement calls for him serving in the role of president until June 30, 2015. When asked by UI Board Chair Christopher Kennedy last March if he would consider moving into the role, Easter said his response was, "Let's see how it goes." And he initially agreed to two years in the position. "The reality is it's taken me about a year to understand the issues we are dealing with and those need to be dealt with another year before the search process (for the next president) gets underway," Easter said. The story was reported by the Champaign News-Gazette on July 25, 2013. Some people dream of a European vacation. University of Illinois Springfield junior golfer Jacob Wherley has made it happen. The 20-year-old is headed for Scotland and one of the oldest golf courses in the world and the birthplace of the sport: St. Andrews. He will participate with the USA Athletes International team in the IGI Series Aug. 5-13. It’s across the pond for Wherley and 10 other Great Lakes Valley Conference golfers as well as University of Missouri-St. Louis coach Troy Halterman, who is overseeing the team. When UIS men’s and women’s golf coach Frank Marsaglia approached Wherley with the offer, he was immediately interested. Players were recommended for the team based on athletic skill and their ability to represent their school and country in a positive manner. They also had to pay for their trip. “I didn’t beg my parents, but I said I’ll never get this opportunity again and they agreed,” said Wherley, an Ozark (Mo.) High School graduate. “It’s a trip of a lifetime. I couldn’t really pass it up." The story was featured by The State Journal-Register on July 24, 2013. Sixteen students from Ashikaga, Japan are in Springfield this week learning about science. These students are taking part in a super science project lead by faculty at the University of Illinois Springfield. The students are from Ashikaga Boys High School. Along with the students were four faculty members. They learned about all sorts of things like aquatic ecology, biology, food web concepts, and water analysis. "The people in America are very good," said Kazuaki Kobuna, Ashikaga High School principal. "They are very kind to us. They are open minded. So, students are having fun studying here." The students will be in Springfield until Thursday. Ashikaga, Japan is the sister city to Springfield, and is more than 12,000 miles away. The story was reported by WICS-TV 20 on July 17, 2013. 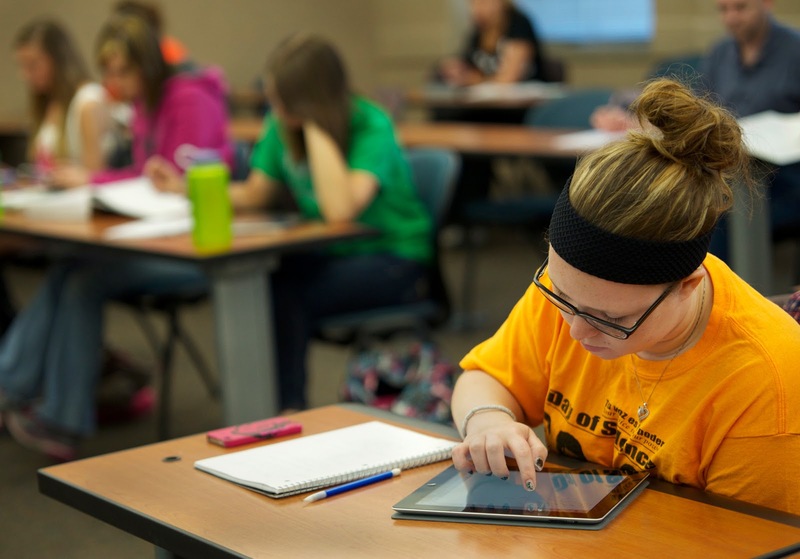 A summer chemistry class at the University of Illinois Springfield is testing out a new app. The class is one of two in the nation to test the app, developed by PerkinElmer Software. Organic chemistry relies a lot on the drawing of chemical formulas, which is now easier and more accessible than before with the ChemDraw app. It's designed after a computer program that has been around for nearly 30 years. Layne Morsch, a professor of chemistry, said the new app version of the program is transforming the classroom. "What I have seen over the years in teaching organic chemistry is that when I give problems for students to do, about half the students try them, and about half of them just sit and wait," Morsch said. "Now since they have to send me their results as they're working on them, every student is working on the problems and it helps them to see if they know what they're doing or whether they don't understand what they're doing." The app can be found in the iTunes App Store for anyone to check out. The designers hope it will change the way students study chemistry. The story was featured by WICS-TV 20 on July 16, 2013. A triple bogey didn’t get Jessica Lieber down. The 2013 Galesburg High School graduate carded a 2-under-par 71 and holds a stroke lead over Taylor Thompson after Tuesday’s opening round of the Women’s All-City Golf Tournament at Bunker Links Golf Course. Lieber sat at 6-under-par heading into Bunker’s No. 15, but struggled on the par-3 90-yard hole. “I was pleased despite my bad hole,” said Lieber, who played golf and basketball for the Silver Streaks and will hit the links for the University of Illinois at Springfield this fall. “I didn’t have a club for that distance, so I tried hitting a knock down shot and still hit it a little bit over but that’s no excuse. You just have to fight back after that." Lieber was featured by the Galesburg Register-Mail on July 17, 2013. Ian Mork, a Kansan, is coaching the tiny Central American country of Belize in its first ever major international soccer tournament. He is an American, and his connection to Belize starts in Springfield. Mork found himself in a wild scenario and coaching the 130th-ranked country in the world against the United States men’s national team at the CONCACAF Gold Cup last Tuesday in Portland, Ore. The U.S. won 6-1, but the match put Mork, 41, and his unusual story in the spotlight. He is a native of Wichita, Kan., and a youth trainer, scout and coach in San Francisco. Mork forged a friendship with Belizean Rene Montero, a native of the English-speaking country of 300,000 bordered by Mexico, Guatemala and the Caribbean Sea, when they were roommates and teammates at Sangamon State University, now the University of Illinois Springfield. “I turn the TV on and there the two of them are together, holding hands and listening to the national anthem before the game,” said Aydin Gonulsen, who coached the pair at Sangamon State. “They showed Ian and Rene several times throughout the match on the sidelines. To see these guys coaching at this level makes my insides feel so good." The story was featured in The State Journal-Register on July 13, 2013. Five osprey chicks from Langley Air Force Base in West Virginia arrived in Illinois on Wednesday night, the first step in an eight-year program to re-establish nesting ospreys in the state. The osprey is a fish-eating hawk that is listed as endangered in Illinois. Young birds are loyal to the places where they were raised, often returning as adults to nest. The Illinois Department of Natural Resources wants to take advantage of that tendency by placing young in a specially designed nest box at Anderson Lake southwest of Havana. Graduate students from the University of Illinois Springfield will monitor the birds, leaving food and keeping the area clean until they are old enough to leave the nest. The process is known as hacking, a falconry term for gradual release. When the birds are ready to fly, the doors of the hack box will be opened so the young ospreys can test their wings. Students also will attach radio transmitters so they can keep track of their movements. The story was featured in The State Journal-Register on July 14, 2013. Given this year’s flooding — and once-in-a-hundred-years storms that are happening semi-regularly — perhaps it’s worth considering the impact of global change via Emiquon. So this month’s Nature Trek “walk and talk” science series explores the prairie restoration project at Emiquon with an emphasis on the impacts of recent floods. The session begins with discussion at 6:30 p.m. Thursday, July 18, at Therkildsen Field Station at Emiquon. Then it continues with a walk through the tallgrass prairie to take a look firsthand. Speakers are Amy McEuen, associate professor in the biology department at University of Illinois Springfield, and Michael Wiant, Director of Dickson Mounds Museum. Nature Trek is held on the third Thursday of each month from April through September. It is free, for all ages, and no registration is required. But participants are encouraged to dress appropriately for both hiking and the weather. The story was featured by the Peoria Journal Star on July 9, 2013. Newly hired University of Illinois Springfield baseball coach Chris Ramirez recognizes similarities between the Prairie Stars’ program and the one at NCAA Division I Texas A&M-Corpus Christi, where he spent the previous six seasons. Since 2008, the 30-year-old Iowa native has served as assistant coach and recruiting coordinator for Texas A&M-Corpus Christi. Prior to his stint in Texas, Ramirez was a hitting coach and recruiting coordinator at Southeastern Community College in West Burlington, Iowa, and an assistant for the Madison Mallards of the Northwoods summer league. He was head coach at West Burlington High in 2006. Ramirez is the third UIS coach since the Division II program’s inaugural season in 2011. He replaces Mike Zandler, whose contract was not renewed after two seasons for undisclosed reasons. It is Ramirez’s first head coaching position at the college level. He will earn $47,500. “I really liked (UIS athletic director Kim Pate’s) vision,” he said. “I really felt she wanted to hire a head coach to partner up with to get this program going and do things the right way. Ramirez was featured by The State Journal-Register on July 2, 2013. Nineteen area high school seniors have been selected to take part in an innovative new course designed to introduce entrepreneurship to teenagers. The first class of the Sangamon County CEO program was announced Wednesday. Among the class are seniors from all three Springfield public high schools and Sacred Heart-Griffin, Auburn, Rochester and Tri-City high schools. The program, which began in Effingham County, was brought to Sangamon County “by local business and community leaders unsatisfied with traditional educational and economic development approaches and outcomes,” according to information about the program. Program chair Bruce Sommer, business owner and business management professor at the University of Illinois Springfield, said the rigorous curriculum will be unlike any high school-, or even many college-level, courses." The program was featured by The State Journal-Register on July 1, 2013. A new quality-of-life survey finds that although residents believe Sangamon County is a good place to raise and educate children, many worry about crime, aren’t confident in local elected officials and can’t afford to provide adequate housing, food or health care for their families. The findings of the Sangamon County Citizen Survey, which are detailed in a 42-page report, offer a unique glimpse into the lives and attitudes of residents. Kirzinger said the goal is to conduct the same survey every two years for the next 10 years to track changes in attitude or public opinion. The project is a collaborative effort by the Community Foundation for the Land of Lincoln, the United Way of Central Illinois and the Center for State Policy and Leadership. The story was reported by The State Journal-Register on June 28, 2013. This week marks the 150th anniversary of Gettysburg, the most famous battle of the Civil War. The Union victory July 1-3, 1863, checked the northern invasion of Robert E. Lee and is considered the turning point of the war. An Illinois flair was found in the opposing side at Gettysburg. Confederate Maj. Gen. George Pickett is best remembered for “Pickett’s Charge,” a sweeping frontal assault that failed July 3, the final and decisive day of the battle. Though born in Virginia, he spent his much of his teen years with an uncle, Andrew Johnston, who was a Quincy lawyer. A newspaper editor and political force, Johnston used his connections to help secure an appointment to West Point for his nephew from Congressman John T. Stuart of Springfield, who was Lincoln’s law partner. Legend has wrongly claimed that Lincoln actually sponsored Pickett’s nomination, but Lincoln was not in the U.S. Congress at the time. Davis was featured by The Southern Illinoisan on July 1, 2013.